BACKGROUND AND PURPOSE: Tuberous sclerosis presents with characteristic cortical hamartomas and subependymal nodules associated with seizures. The purpose of this study was to use pulsed arterial spin-labeling (PASL) to quantify the perfusion of the cortical hamartomas and correlate the perfusion values with seizure frequency. 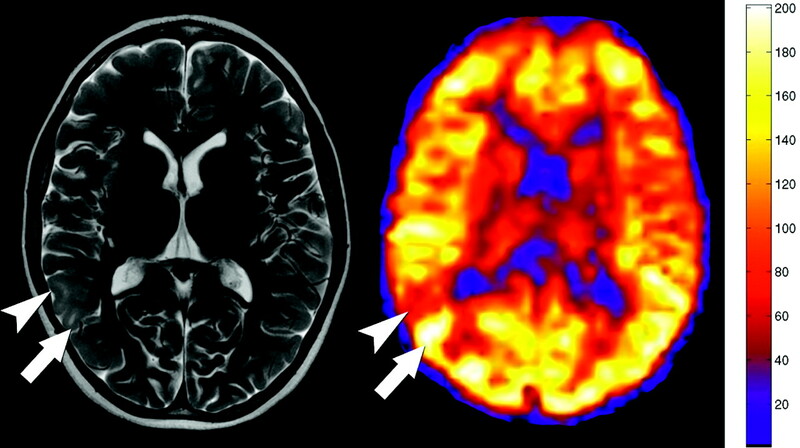 MATERIALS AND METHODS: A retrospective search yielded 16 MR imaging examinations including conventional MR imaging and PASL perfusion performed in 13 patients (age range, 7 months to 23 years) with a history of tuberous sclerosis. The mean perfusion of each cortical hamartoma greater than 5 mm in size localized with conventional MR imaging sequences was obtained with use of manually drawn regions of interest. Cortical hamartomas were classified as normal, hyperperfused, or hypoperfused on the basis of the mean and SD of the unaffected cortex. Correlation was made between perfusion imaging, conventional imaging, and clinical history. RESULTS: Of the 245 cortical hamartomas, 227 (92.7%) were hypoperfused, 10 (4.1%) were hyperperfused, and 8 (3.3%) were unchanged relative to the mean gray matter. One patient had a subependymal giant cell astrocytoma with a mean perfusion of 93.5 mL/100 g tissue/min. There was a statistically significant positive correlation between seizure frequency and the number of hyperperfused cortical tubers (r = 0.51; n = 16; P = .04), with higher seizure frequency associated with a greater number of hyperperfused cortical tubers. There was no significant correlation, however, between seizure frequency and the overall number of cortical tubers (r = 0.20; n = 16; P = .47). CONCLUSIONS: The PASL technique can assess and quantify the perfusion characteristics of a cortical hamartoma. Most lesions are hypoperfused; however, both normally perfused and hyperperfused lesions occur. The presence of hyperperfused cortical tubers was associated with increased seizure frequency. We present the cortical hamartoma perfusion imaging findings in a series of 13 patients evaluated with PASL. We propose that most lesions are hypoperfused; however, a significant percentage of lesions will show normal perfusion or hyperperfusion. An accurate depiction of the perfusion characteristics of the cortical tubers is necessary before using the perfusion findings for localization of the epileptogenic focus. The PASL technique was performed in 9000 consecutive clinical MR imaging examinations performed on both 1.5 and 3T scanners from December 2006 through July 2008. We retrospectively identified those cases of patients with a clinical history of tuberous sclerosis. Patient characteristics, including seizure frequency, cortical hamartoma burden, and conventional imaging findings were correlated with cortical hamartoma perfusion values. Seizure frequency, age, hamartoma burden, average gray matter perfusion, and average hamartoma perfusion values are listed in the accompanying Table. Thirteen patients (mean age, 6.8 years; age range, 7 months to 23 years) were identified with a history of tuberous sclerosis. The mean perfusion values of each patient are summarized in Fig 1. Eight patients had no seizures within the last 3 months. Five patients had 1 to 4 seizures per week. Summary of hamartoma perfusion data for each patient. 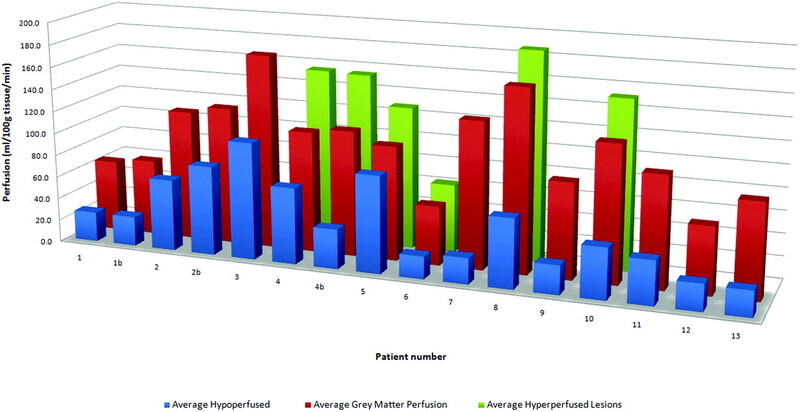 The average of the hyperperfused lesions is shown in green. The average of the hypoperfused lesions is shown in blue. The mean unaffected gray matter perfusion is shown in red. We localized cortical hamartomas using the conventional T1- and T2-weighted sequences. We cross-referenced the gray-scale PASL images to the conventional sequences to draw regions of interest on the PASL sequence corresponding to the cortical signal intensity abnormality. Mean CBF of the region of interest was recorded. As an internal control, the mean and SD of 20 regions of interest of unaffected gray matter (no cortical or adjacent white matter signal intensity abnormality) in the same patient were recorded. Hyperperfused and hypoperfused lesions were defined as perfusion measurements respectively above and below 1 SD from the mean. Normal perfusion was defined as within 1 SD of the mean. Region-of-interest analysis of 1 patient with subependymal giant cell astrocytomas (SEGAs) was also included but was reported separately from the cortical tubers. The Pearson correlation coefficient was used to investigate the relationship between seizure frequency and total number of cortical tubers, as well as number of normoperfused, hyperperfused, and hypoperfused cortical tubers. The Pearson correlation coefficient was also used to investigate the relationship between the overall number of cortical tubers and the number of normoperfused, hyperperfused, and hypoperfused cortical tubers. We performed all statistical analyses by using the Statistical Package for the Social Sciences 16.0 (SPSS, Chicago, Ill). We identified 245 cortical hamartomas greater than 5 mm in size in 13 patients: 227 (92.7%) were hypoperfused (Fig 2), 10 (4.1%) were hyperperfused (Fig 3), and 8 (3.3%) were unchanged relative to the mean gray matter. The mean CBF of the hypoperfused hamartomas was 46.9 mL/100 g tissue/min (range, 4.7–147.7 mL/100 g tissue/min). The mean CBF of the hyperperfused hamartomas was 127.6 (range, 61.4–196.9 mL/100 g tissue/min). Hypoperfused cortical tuber. Axial T2 (left), axial T1 (center), and quantitative CBF map from the PASL sequence show a cortical tuber (arrowheads) with high T2 signal intensity, mixed T1 signal intensity, and significant hypoperfusion on PASL. Hyperperfused and hypoperfused cortical tubers. Axial T2-weighted image shows multiple cortical tubers in the right parietal lobe. Additional smaller tubers are seen in the left frontal cortex. Quantitative CBF map from the PASL sequence demonstrates alternating bands of hypoperfusion (arrowhead) and hyperperfusion (arrow) corresponding to the tubers. Additional areas of hyperperfusion are seen in the cortex, but these tubers did not meet size criteria to be included in the study. Preliminary analyses were performed to ensure no violation of the assumptions of normality, linearity, and homoscedasticity for the correlation analysis. There was a strong and statistically significant positive correlation between seizure frequency and the number of hyperperfused cortical tubers (r = 0.51; n = 16; P = .04), with higher seizure frequency associated with a greater number of hyperperfused cortical tubers. There was no significant correlation, however, between seizure frequency and the overall number of cortical tubers (r = 0.20; n = 16; P = .47), number of normoperfused cortical tubers (r = −.06; n = 16; P = .82), or hypoperfused cortical tubers (r = 0.14; n = 16; P = .61). Region-of-interest analysis of the 1 patient with 2 SEGAs showed the mean perfusion values in these lesions to be 93.5 mL/100 g/min, greater than 2 SDs above the mean unaffected gray matter perfusion of 60 mL/100 g/min. Tuberous sclerosis complex (TSC) is an autosomal-dominant disorder with a high spontaneous mutation rate. TSC1 or TSC2 gene mutations, which generate the proteins hamartin and tuberin, result in the clinical manifestations of the disorder. The tumor suppressor protein malfunction causes the variety of disease manifestations on the basis of the expression and distribution of the proteins.24 The more severe the tumor suppressor protein malfunction, the more severe the clinical manifestations.25 Cortical tuber burden has been correlated with seizure onset and frequency, with mixed results.26-28 Our study showed no statistically significant correlation between total cortical tuber count and seizure frequency. The phenotype and mutational analysis of the patients in our study are unknown. The variability in cortical tuber count and symptoms may be related to underlying genetic variability in our series. Hamartomas have been reported to degenerate into astrocytomas.3-5 Two SEGAs had developed in 1 patient. 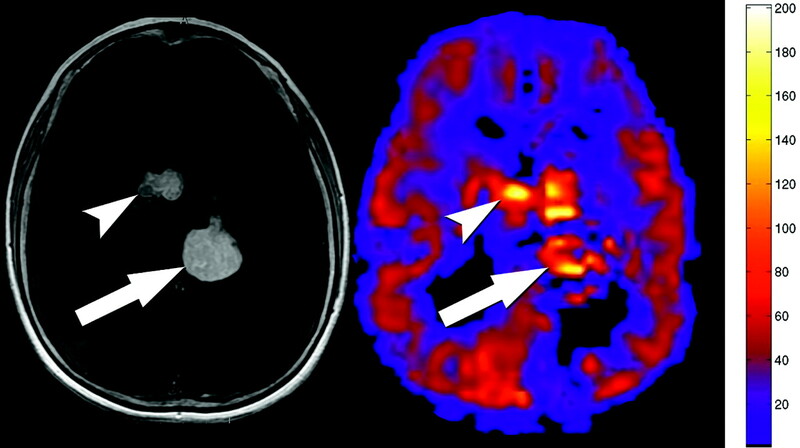 Mean perfusion values in these lesions were significantly increased (mean, 93.5 mL/100 g/min) compared with unaffected gray matter (mean, 60 mL/100 g/min) despite susceptibility artifacts from calcifications in the SEGAs (Fig 4). Given the limited number of SEGAs in our study, the sensitivity and specificity of hyperperfusion in a SEGA remain uncertain and would need a larger study for further evaluation. Subependymal giant cell astrocytomas on T1 postcontrast and PASL. Mean perfusion of the lesions was 93.5 mL/100 g/min. Despite some calcifications in the tumors, the PASL sequence still showed that the lesions (arrow and arrowhead) were significantly hyperperfused relative to mean gray matter. A third lesion is partially seen on the contrasted image at the left foramen of Monroe. In our study, to improve the accuracy by avoiding spurious CBF measurements given the low signal-to-noise ratio of the PASL sequence, we did not include lesions smaller than 5 mm. The cortex involved with smaller hamartomas had perfusion heterogeneity, but no single cortical hamartoma greater than 5 mm in size could be localized to the perfusion abnormalities. It is possible that our study underestimated the number of hamartomas because of the size threshold. Another limitation of PASL was that currently our sequence generates CBF only and does not characterize changes in cerebral blood volume or mean transit time. Dynamic susceptibility contrast has been used to evaluate malformations of cortical development.16 Widjaja et al16 found a significant reduction in the hamartoma blood volume but no significant difference in transit time in patients with tuberous sclerosis complex. They also noted that several hamartomas had normal blood volumes. Presumably, lesions in our study were hypoperfused because of decreased blood volume, and those with normal perfusion had normal blood volumes. Widjaja et al16 examined 59 tubers and may not have had enough patients to detect the small population of hyperperfused tubers. We believe the hyperperfused tubers in our study would show increased blood volume, which may be an intrinsic property of the tuber or reflect epileptogenic activity. Gliosis in the white matter adjacent to the hamartoma has been described previously.30 This gliotic white matter may be contributing to the perfusion measurements. It is possible that the regions of interest included small portions of white matter, which could underestimate the perfusion values. Calcifications within a cortical tuber could also artifactually lower PASL perfusion measurements because of the susceptibility effects.23 Cortical tubers have been shown to calcify, but this is more characteristic of subependymal nodules.11 The patients in this series did not show calcifications or susceptibility artifacts in the selected cortical tubers. Alternating bands of hyperperfusion and hypoperfusion (Fig 3) have also been seen with nuclear medicine SPECT studies.18,33 However, the hyperperfused lesions were identified during the ictal acquisition. The patients in our series did not have clinically apparent seizures during or preceding perfusion imaging. In 1 patient with hyperperfusion, the perfusion pattern was stable at 6-month follow-up. We are uncertain if the patient was having subclinical seizures or if the tubers had baseline hyperperfusion. Although the patient population in our study was small, those patients with hyperperfused cortical tubers did have a statistically significant positive correlation with clinical seizure frequency. However, only 3 of the 5 patients with frequent seizures had hyperperfused tubers, and, in a similar fashion, 3 of the 5 patients with hyperperfused tubers had seizures. This means that although there is a statistically significant association between hyperperfused tubers and seizures, a significant population of patients with seizures will not have hyperperfused tubers. In practical terms, the relationship between hyperperfusion and seizure frequency seems to be an association rather causal. We are uncertain if the identified hyperperfused tubers were the epileptogenic focus. Additional long-term studies with multimodality functional imaging and postsurgical correlation would be necessary to make this determination. The perfusion characteristics of cortical hamartomas have not been previously evaluated with PASL perfusion imaging. The stratification of lesions into high, low, and normal groups with use of unaffected gray matter as an internal control shows that most lesions are hypoperfused; however, a significant number of lesions are hyperperfused. The presence of hyperperfused cortical hamartomas is associated with an increased frequency of seizure activity. Future studies may incorporate PASL into the seizure algorithm by use of perfusion changes to complement multimodality localization of the epileptogenic hamartoma. We thank Kathy Pearson for help with computer programming. This work was supported by the Human Brain Project and the National Institute of Biomedical Imaging and Bioengineering through grant EB004673. This work was also partially supported by the Center for Biomolecular Imaging of Wake Forest University School of Medicine, Winston-Salem, NC. Wang J, Licht DJ. Pediatric perfusion MR imaging using arterial spin labeling. Neuroimaging Clin N Am 2006;16:149–67, ix. Whitlow CT, Pollock JM, Mussat-Whitlow B, et al. Changes in global rates of cerebral perfusion associated with normal development as measured with MR arterial spin labeling. Annual Meeting of the American Society of Neuroradiology; June 2–5,2008; New Orleans, La. Accepted after revision October 31, 2008.